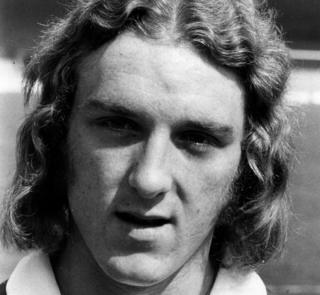 Former England and Ipswich Town footballer Kevin Beattie has died of a suspected heart attack aged 64. Beattie played for Ipswich during their most successful spell and was widely regarded as one of the club’s greatest players. His manager at Ipswich, Sir Bobby Robson, described the defender as the best English player he had ever seen. He died at home early on Sunday, the day after broadcasting live for BBC Radio Suffolk. Beattie was a PFA Young Player of the Year, an FA Cup and Uefa Cup winner and won nine caps for England. His career was dogged by injury and all but ended at the age of 28, when he left Ipswich. Thirty years later he was living in a council-owned bungalow in Wren Avenue in Ipswich, where he cared for his wife who has multiple sclerosis. On Saturday, Beattie appeared in the BBC Radio Suffolk studio for his regular slot on the Life’s a Pitch show. Presenter Mark Murphy said he had been on “fine form” and added: “To say I’m devastated is an understatement. “He was my co-host for the past seven years and I am proud to call him my friend. “He was without a doubt the greatest ever footballer to pull on the Ipswich Town shirt. “The fans idolised him and he loved the fans with equal measure. He would be mobbed wherever we went. In 2012, he pleaded guilty to falsely claiming almost £9,000 by failing to declare he worked for the radio station as a pundit. He was given a 12-week curfew and an electronic tag and apologised to fans at the time for making a “silly mistake”.